Ahhh, Lovecraft’s Cthulhu Mythos! Beloved the world over by artists, geeks and those who don’t have to pay licence fees! It’s astonishing how ubiquitous Lovecraft’s creations have become, and I often wonder what the man himself, brilliantly-imaginative-yet-unfortunately-racist intellectual that he was, would have made of it all. Especially the Cthulhu slippers. 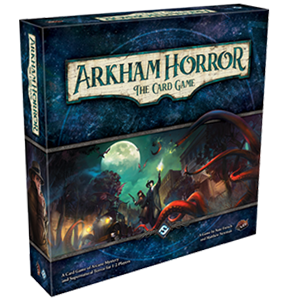 Fantasy Flight Games have certainly done well out of the Mythos, developing their own, somewhat more gung-ho (and thankfully, not racist at all) version, dubbed ‘Arkham Horror’. And here’s the card game version, a beguiling confection of atmospheric scenarios, lovely art and design, a touch of character development and a freshly-baked cake of familiar LCG ingredients. Due to the scenario-based semi-roleplaying experience, it does fall short in the replayability department somewhat, but what better incentive to keep buying those expansions, aye? I get an 404 NOT FOUND error when clicking on the rules summary link. Nice Summary. Very useful indeed. Thanks. Just came across this. Well put together. I look forward to having it as a resource for next time I play.